Springfield Armory's XDM pistol line has been held in high regard since it was introduced in 2007. With a seemingly endless list of fantastic features, the XDM has become extremely popular in just about every area of the shooting community. 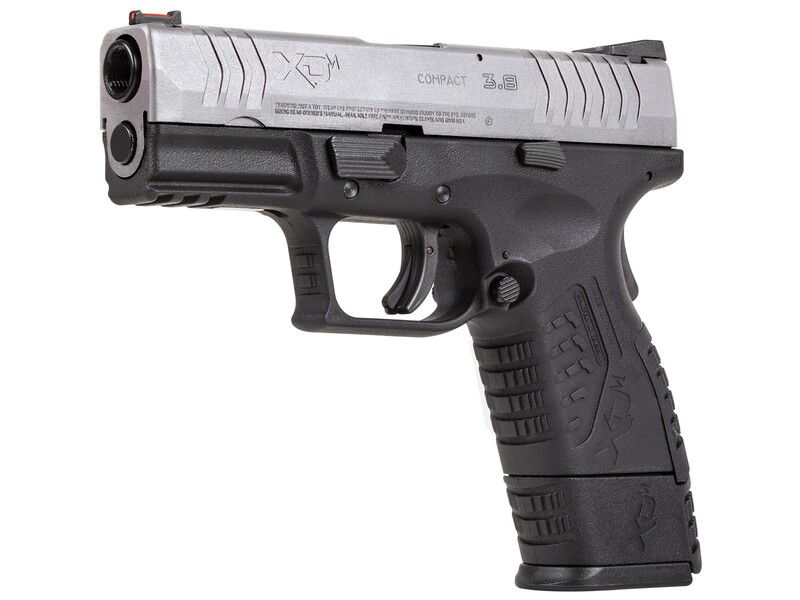 The XDM 3.8", being very popular among concealed carries and compact pistol enthusiasts. Springfield Armory brings the XDM 3.8 to the airgun world, with this Bi-tone beauty. Sporting an eye catching silver slide, atop the standard black polymer frame, with all of the markings and logos normally seen on the firearm. This variant will garner attention not just for the striking silver slide, but also for authenticity and realism. Deep slide cerrations allow for a firm grip while performing slide manipulations, and you'll find all of the controls mimic those found on the real steel version. A metal, 20 round magazine adds heft and drops free with an easy press of the ambidextrous magazine release. Sending BBs down range at speeds of up to 270 fps, all powered by a single 12 gram CO2 cartridge, the XDM is simply fun to shoot. The realistic feel provided by the full blowback of the slide with each shot is perfect for practice and training. And just like the firearm, the 3.8 comes with three backstraps to accomodate all hand sizes, and three grip frame extensions in corresponding sizes to provide a full grip for better control.